Small teams visited Holme, Snettisham and Heacham areas to recce and look for colour marked birds during the morning high tide, arriving from 07:00. Snettisham RSPB Reserve – The majority of the team visited the RSPB reserve to look for birds. Many thousands of Knot were pushed off the mud into the pits due to the small tide surge and the team managed to resight numerous leg-flagged Knot including some from The Netherlands and Iceland as well as the UK. One individual sighting of note was flag KTU observed during the mornings visit and quickly reported by another observer on the Stour Estuary, a known wintering site for this individual, three days later. 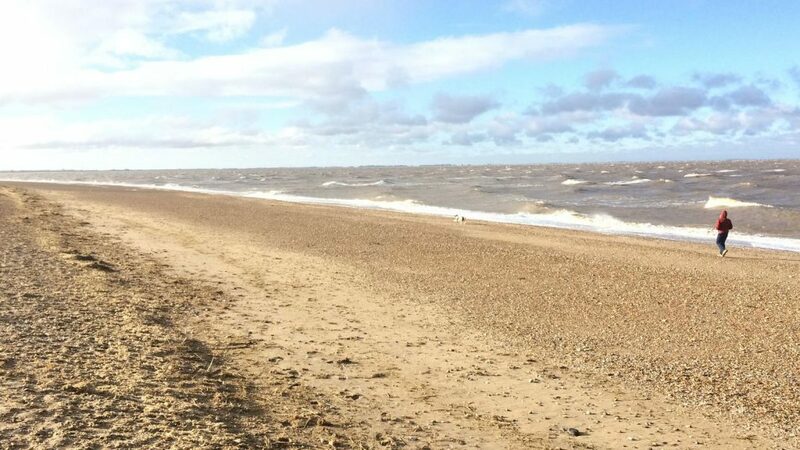 Snettisham Beach and the full stretch of the Heacham beaches – These sites were reported to have been virtually covered ahead of high tide time given the conditions. Few birds were observed but small hundreds of Sanderling were thinly spread along the beaches and c. 40 Turnstone (unringed). Heacham fields – One sizeable flock of 250 Curlew were located behind the sea wall roosting in a winter cereal field around high tide adjacent to the caravan park. The group managed to read six colour flags among the flock. No other flocks were observed in some of the more regular fields. Holme – Several thousand Oystercatchers and high thousands of Knot were present in the high tide roost however the water covered earlier than expected at Holme, as it did at other sites, and curtailed opportunities to find colour marks. Various maintenance and data-checking jobs were carried out during the afternoon followed by a brief period without power due to a storm. The decision was made to set cannon nets on Snettisham Beach in preparation of a catch on the Sunday morning high tide. Arriving at c. 9 pm the team worked very well during some continuing poor weather to set three small-mesh nets. The hide team and two long stops got into position on the beach before light with the remainder of the team getting into position behind the sea wall shortly after. A flock of several hundred Oystercatchers were already roosting along the beach in front of the nets. Many of the birds were soon displaced by some vegetation being blown through the flock but c. 300 oystercatchers remained on the beach. In addition there were 20+ Grey Plover and similar numbers of godwit present as well as a mobile flock of c. 100 Sanderling. It was anticipated that the tide would only allow the end of the Oystercatcher flock to be caught but a well-timed wave pushed a large group into the catching area and a safe catch was made. Once extracted from the nets and quickly placed into the keeping cages, ringing and processing was carried out on the beach in fair weather. After the catch the team returned to the base house for breakfast, data checking and tidying before departure.